When her parents go through a rough patch, American teenager Zoe (Jaylen Barron), along with her mother and younger sister Rosie (Navia Ziraili Robinson), move to England for the summer to live with their grandfather. When Rosie goes missing, Zoe searches for her and ends up at the Bright Field Stables next door, where she makes friends with some of the riders. 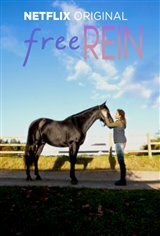 As she's searching for Rosie a spirited horse named Raven gets loose, and Zoe helps catch him — in fact, the horse seems to feel a bond with her. She begins to learn to ride and finds she's a natural. The only problem is — her mother doesn't want Zoe and Rosie around horses because she thinks they're dangerous. Not only that, but horses are being stolen and Zoe thinks Raven is the target. She wants to catch the horse-nappers and save Raven, so she has to go back to the barn, no matter what her mother says.